RESOLUTION REACHED: Faculty of Education Issues Resolved! Newman Students’ Union met with the University on Friday 28th September 2018 to discuss resolving the ongoing issues with the Faculty of Education. A previous statement outlined that the Executive Committee have been committed to resolving these issues behind the scenes, and NSU are delighted to announce that both parties have come to an agreement of resolution. Sign a new Student Charter with the students’ Union. This is an agreement with the Students’ Union and the University about shared values and expectations of both the University and the Students. As part of this, all students shall have a “Personal Tutor” who will be their main point of contact throughout their time at Newman, therefore addressing the communication issues highlighted in the apology. 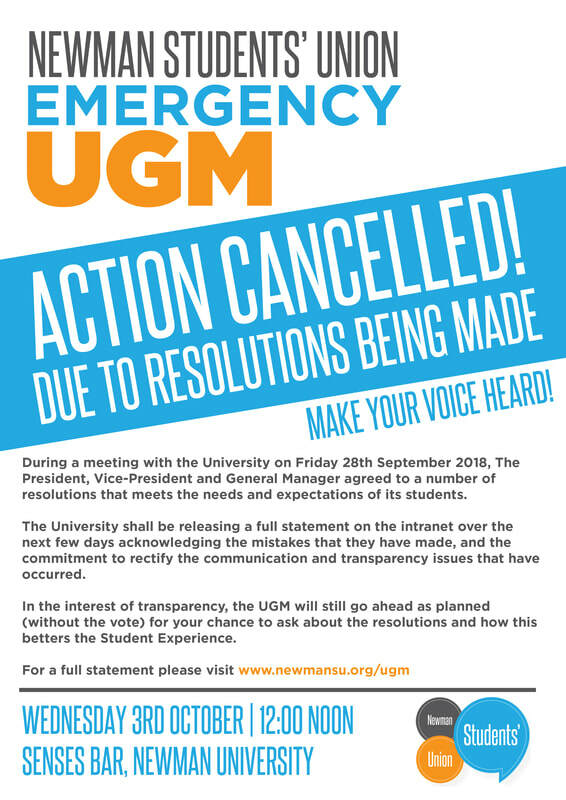 As the campaign was entirely outcome focused, NSU has therefore cancelled the vote at the Emergency Union General Meeting on Wednesday 4th October 2018. However, in the interest of transparency, the meeting will still go ahead as planned to discuss with students the details of the resolution and answer any questions they may have. The Executive Committee are extremely grateful to the University for the opportunity to resolve these issues, and look forward to a continued and strong working relationship that focuses on student experience. NSU also want to apologise to any staff who may have been affected by this action, and to any offence that may have occurred.